The pursuit of happiness is something that has been approached by many authors and a subject of great interest to us all. The truth is that happiness is a difficult matter to figure out. Finding our place in life where we feel happy and in harmony with who we are is a complex journey. However, we should never let complexity prevent us from embarking on the road of happiness, as the journey itself is one of the most precious things anyone can ever experience in life. To shed some light on the matter, we turned to the people who claim, year after year, to be the happiest in the world. For 40 years, Denmark has reigned as number one on the famous “World Happiness Report” by the United Nations, despite the endless winters, huge taxes (the highest tax rate in the world), and the many pigs (Denmark has more pigs than people living there!). What is it about Danish society that seems to suit citizens’ individual and collective needs, which translates into a general feeling of well-being and happiness? As a Dane who has lived abroad most of her life, I thought I’d set out to try and answer the question. Along the way, I found that the keys to Danish happiness do not need to be exclusively reserved for the Danes. All of us can plant these seeds of happiness inspired by Danish values. I've lived in France (number 32 on the world happiness report) for the past 20 years and I still live happy as a Dane. We hear a lot about the truly unique Danish concept of hygge (a warm, cozy feeling of being together and caring for each other in comfortable surroundings) at the moment. Some things that the Danes are good at — in addition to the hygge lifestyle — turn out to be what I have called the seeds of happiness, and they’re not only reserved for the Danes, but for all of us to plant, no matter where we live. The first seed I like to plant is trust. In Denmark, trust stands at almost 80% amongst citizens. In many countries, it is around 5% in the worst cases, with an average in Europe of around 25% (the U.S. is at 36%). Committing to trust means first being a trustworthy person ourselves and showing trust in others. For Danes, trust seems natural and often foreigners are surprised when they see Danes leaving their babies outside restaurants in their strollers while having coffee inside. While some people might say that nobody is watching the babies, we would say that everyone is. Feeling you can trust other people is essential to leading a positive lifestyle, as it provides the foundation to build happiness within and around you. Let’s take a look at another important seed: work-life balance. The Danes do this pretty well. For example, if you call an office after 4 p.m., there is usually nobody around anymore. In Denmark, people devote 69% of their day to personal activities! This has placed them in first place according to research conducted by the OECD, while the U.S. ranked 32nd. Spending time doing what makes the Danes happy is explained by the fact that they don’t put material wealth before their own well-being. Fancy restaurants and private jets are not at all the essence of happiness to Danes! They place a premium on spending time with their family and friends more than many other Western countries. When the Danish prime minister was suspected of cancelling a meeting with 80 international diplomats for personal reasons (his daughter was sick), his image was unscathed, and it also had a positive effect on his relationship with Danish voters. He was leading by example based on common Danish values. The Danes also have a real sense of community, reflected in the fact that in Denmark, 7 out of 10 Danes like paying taxes because they feel part of a bigger, collective project — the welfare state. They are not victims of the system; they are part of it. They feel individual responsibility for the system to work, and they are proud and happy that it provides citizens an equal chance in life. One of the important opportunities that people can receive is an education. It is in this area that Denmark is truly surprising to many. The main purpose of the Danish educational system is to develop the personality of the child. They value all talents equally, whether it is being good at sports, creativity, manual work, or the more traditional studies like math or languages. You could say they’ve turned the traditional system on its head, whereas a lot of Western countries focus on the intellectual elite, a system which encourages students to strive for top marks. Not all students can be the best, which fosters feelings of frustration, disappointment, and stress… especially for those who shine in areas outside intellectual studies. The Danes' focus isn’t on the top 5% and trying to make sure they make the grades for Ivy League, Les Grandes Écoles, or Oxbridge. Instead, it’s about helping the 95% below them (the very clever ones will figure it out anyway!) to find their place in society and actually enjoy the time at school no matter what they are good at. Sound crazy? A recent PISA survey revealed that students who enjoy studying perform 20% better than students who don’t. In other words, fear of bad grades, fear of disappointing parents, and fear of the future can be detrimental to a student’s ability to learn. Parents also play a critical role here in education, by allowing children to make their own way in life. Around 70% of Danish children leave home at 18 years old to pursue their own path. Danish education is free and students get paid around $900 per month by the government to make sure everyone has an equal opportunity to become what they want and inspire to be. Being free to be yourself and letting other people be free to choose their own role in society creates a solid foundation for happiness, both individually and collectively. The seeds I’ve discussed are a few of the Danes’ secrets to happiness. In Danish society, each person feels the interconnectedness of their lives and the role they need to play in society. Protecting their own interests above the common good does not, it would seem, generate happiness, neither for the individual, nor for society. 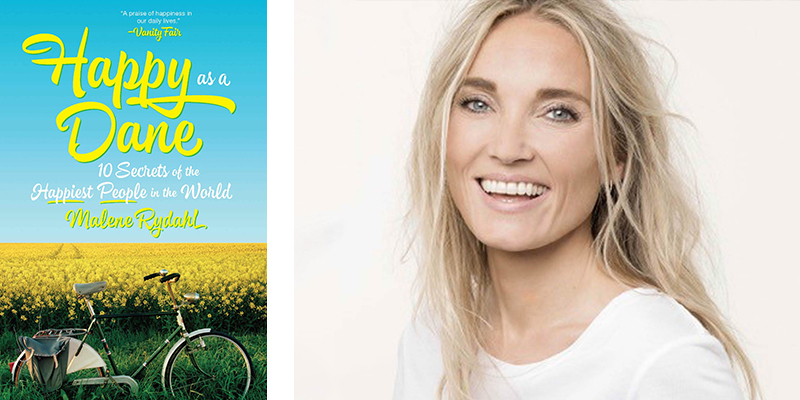 Planting the Danes' seeds of happiness wherever you live is truly the heart of my book. I hope it inspires you. Malene Rydahl is a writer, executive coach, and keynote speaker on happiness and well-being, named one of the top 24 Women of the Year by the French news magazine L’Express, and appointed goodwill ambassador of Copenhagen. Born in Denmark, she is based in Paris. Happy as a Dane is her first book. One Response to "Happy as a Dane: Planting Seeds of Happiness the Danish Way"
In 1971, I entered the field of psychiatry with the intention of engaging in a life-long study of human nature. My first philosophical theater was a maximum-security prison. The social structure inside prison was a stark reflection of dominance hierarchy, the emblem of our primate order. I realized that the well-developed “Machiavellian” analytic cognitive capacities of primates (including us) have been evolved upon the loom of a social structure that is comprised wholly of the emotions and motivations of dominance and submission.